We all enjoy a good joke once in a while, but when it comes to the game we love so much, we just can’t get enough. That is why we’ve collected some of the best poker jokes for you in the subject of poker addiction, but it’s not that serious because it’s hilarious, funny and it’s here to make you laugh and feel good that you too may be addicted to the game of poker. So, are you ready to find out the 30 signs for poker addiction? 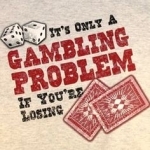 Here are the best poker jokes as for poker addiction and not a word about treatment. Badugi is a draw poker variant (no community cards) which isnâ€™t exactly among the most popular poker variants in the world. There are only a handful of online poker rooms where one can play Badugi, and among these, only PokerStars seems to offer some competition at the Badugi tables. As far as its rules go, Badugi most closely resembles Lowball, in the sense that the lowest hand wins in Badugi too. Chinese poker may not be among the more popular poker variants, nor is it available for online play in any of the online poker rooms (possibly in casinos, but one canâ€™t play against other players there, rather only against the house). Many of pokerâ€™s best known high stakes professionals play Chinese poker though, often for exorbitant stakes, so the game is indeed legit and it does indeed have a kind of a cult following. Any casual Poker player will be aware of many of the subtle variations of the game. Some forms of Poker are showier and strategy based, while some are more built around simple chance and quick thrill. Nearly all incarnations involve the play moving clockwise round a table with players calling, raising, or folding in an attempt to try and get the best five card hand â€“ or at least, to have your opponents believe that that's the case. When you combine two of the most popular casino games of all time, the end result, as you can imagine, will be very popular. That is exactly what video poker is, poker played on a slot machine. Casino giant MGM Resorts International is currently working on the launch of a social gaming website in order to capture some of the growing social gaming market, including poker and bingo. Predictions by Lazard Capital say that the social gaming sector will be worth $9 billion annually by 2015, and many other estimates are much higher. Poker is a very interesting game that took over the world like a storm since an accountant named Chris Moneymaker won the WSOP Main Event in 2003 and that day became a poker champion, a millionaire and from that day on a professional poker player. Poker is available now on hundreds of rooms all over the internet. You can play it for fun and play money or with real money and earn cash, prizes, tickets to big tournaments and more.